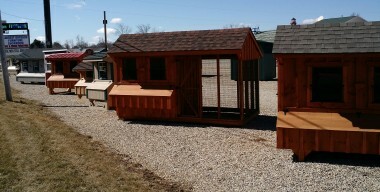 Q: Can I get a different size shed than what you have in stock? A: Definitely, all of our sizes, colors, and window/door placements are all customizable. A: No, our products are built by the Pennsylvania Amish. Q: Is the wood treated? A: Yes, our wood is # 1 grade southern yellow pine. It has been kiln dried, pressure treated, and then kiln dried again. It has very few knots and is unlike any wood found in Michigan. Q: Do I have to stain the furniture? A: No, but if you want it to stay looking new we recommend you stain it once a year for the first few years and then skip a few years. Some people prefer the weathered gray look so staining isn’t necessary. We sell the Cabot stain which Consumer Reports rates number one. Q: Will I need a building permit for a shed? A: We leave this up to the costumer, but the buildings are portable and the most that can happen is that your city can require you to buy a building permit after the fact, so that they can tax you. It is still a good idea to check your city requirements regarding size limitations before delivery. Q: Do I need a cement slab for my shed? A: No, 90% of our buildings are placed onto the grass. The 4×4 skids, floor joists, and plywood floor are all pressure treated. If the ground is out of level we recommend putting 22A road gravel down. (Any compactable gravel is fine, pea gravel is not recommended) Check out our Delivery and Installation page for more info. Q: What is the wood siding made from on your sheds? A: It is Duratemp siding, which is an extremely durable masonite-finished siding which is recommended to be painted once every ten years. It now also has a 50 year warranty. Q: How is it delivered and how far do you deliver? A: It is delivered on a 26’ trailer fully assembled. We have a mule-forklift which we charge $50 more for, if we cannot back the truck and trailer up to the location. We deliver anywhere in state and even out of state. Check out our Delivery and Installation page for more info. Q: How long will it take to get my building? A: One to ten days if in-stock, four to six weeks if we have to order it.